The electrics/electronics area covers a broad field. It comprises the electrical control elements as well as the assistance and safety systems, multimedia systems and lightning technology. Audi leads the competition in all of these area with innovative solutions. The newly developed Matrix LED reading lights each with seven LEDs provide optimum illumination. The passenger can precisely control the brightness, size and focus of the light cone with the rear seat remote control. Behind the steering wheel of the new Audi R8*, the driver feels like a race car driver. All functions are driver-oriented and allow easy operation even when the critical limits are reached – and all without the driver having to take his or her hands off the steering wheel. The newly designed sport seats with integrated headrest provide excellent lateral support. Even more radical seating for a sports car comes in the form of the newly developed R8 bucket seats. These make a clear statement confirming the relationship between lightweight construction and comfort (optional in the V10 and standard in the V10 plus). Audi is driving progress in the area of controls and displays at a rapid pace. A central topic here is the MMI touch. In the next generation, the touchpad will be even more tightly integrated into the MMI control terminal as the surface of the rotary pushbutton, enabling it to also be installed in vehicles with less available space. The new solution makes operation even easier because the driver’s right hand can always rest in the same place. The number of surrounding function buttons will be reduced. Clearly structured and intuitive controls are one of Audi’s great strengths. This is true of every model, from the A1 to the R8 and from the Q7 to the A8. The driver is perfectly integrated in the cockpit of every Audi. The large instruments can be easily read at a glance. Every last control element is logically arranged; each of them provides clear and precise haptic and acoustic feedback when it is actuated. All Audi models feature a multitude of functions. Their displays and controls are bundled into two systems that are optional in some model series, standard in others. One is the Multi Media Interface (MMI) with a large central monitor; the other is the driver information system (DIS), which is controlled via the multifunction steering wheel. The head-up display is a new, high-end feature that Audi makes available as an option in the A6 (Combined fuel consumption in l/100 km: 9.8 – 4.9; Combined CO₂-emissions in g/km: 229 - 129)** and A7 Sportback. It projects the most important information and indications onto the windshield. A TFT liquid crystal display backlit by a white LED generates the color image. Two aspherical mirrors enlarge it and redirect it while compensating for the distortion caused by the shape of the windshield. 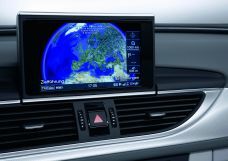 The Multi Media Interface (MMI) from Audi made its debut in the Audi A8 in 2002 and has since become established as the leading user interface on the market. The current large model line-up features the latest-generation MMI in slightly different configurations depending on the model. 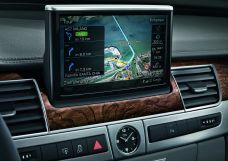 Audi offers the MMI navigation plus as an option in the large sedan model series and in the A7 Sportback. It is operated in an entirely new way – via a touchpad known as the MMI touch. 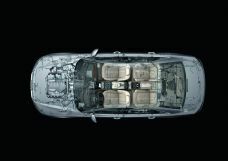 The top models from Audi, from the A6 (Combined fuel consumption in l/100 km: 9.8 - 4.9; Combined CO₂-emissions in g/km: 229 - 129)** to the A8, integrate a multitude of infotainment and assistance functions using a new architecture. Previously developers always installed new sensors and data bus segments to meet the steadily increasing communication requirements of the controllers. Audi is using the Flex Ray bus system for the first time in the A8. This system permits transmission of data between the control units for the chassis and the assistance systems in real time. With the Audi AI remote parking pilot and the Audi AI remote garage pilot, the A8 drives independently and without a driver into a parallel or right-angle parking space in several maneuvers, or forward into a garage. Both systems access the steering, accelerator, brakes, tiptronic and also the optional dynamic all-wheel steering. There have previously been several control units, each evaluating the information they pick up for a defined function. Now for the first time, a central driver assistance controller (zFAS) permanently forms a comprehensive image of the surroundings from the sensor data – for a wide range of assistance functions. Another system that is unique in its class is the predictive efficiency assistant, which is available as part of the Tour assistance package. It works in close conjunction with the adaptive cruise control, the navigation system and the camera-based recognition of traffic signs. 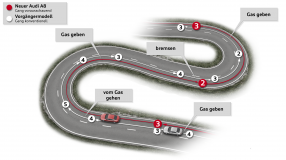 The preselected speed adapts to the road conditions by itself, e.g. the topography of the route, speed limits and the traffic ahead. The adaptive cruise control system works in close coordination with the MMI navigation plus, camera-based recognition of traffic signs and the predictive efficiency assistant, another pioneering system from the assistance package Tour. It automatically adjusts the preselected speed to the conditions – the route topography, speed limits and road users ahead. In collaboration with adaptive cruise control (ACC) and traffic sign recognition, the predictive efficiency assistant adapts the preselected speed to the route and the speed limits. The adaptive cruise control system accelerates and brakes to keep the Q7 at the desired distance from the vehicle ahead. The traffic jam assist can take over steering work in slow-moving traffic on well-built interurban roads at speeds up to 65 km/h (40.4 mph). The system uses the radar and ultrasound sensors as well as the front camera, guiding the car by gently adjusting the steering within system limits. The traffic jam assist orients itself to the lane markings and the other vehicles on the road. Another function of the ACC, the traffic-jam assist, can take over steering at speeds of up to 65 km/h (40.4 mph) on well-developed roads when traffic is congested. The system uses the radar and ultrasound sensors as well as the front camera, guiding the car by gently adjusting the steering and following the traffic ahead within system limits. In doing so, the traffic-jam assist uses the lane markings and other vehicles on the road for orientation. In the speed range of 0 to 65 km/h (40.4 mph) the traffic jam assist, another function belonging to the ACC, can also take over the steering on well-paved roads, as long as the traffic is moving slowly. The system uses the radar sensors and the video camera. It guides the car through gentle steering interventions and follows the preceding convoy of vehicles within the system limits. The traffic jam assist orientates itself by the lane markings and the other vehicles on the road. The Q2 sets new standards with the system Audi pre sense front, which is included as standard equipment. Its radar sensor reliably recognizes critical situations involving other vehicles and crossing pedestrians ahead of the vehicle, even when visibility is poor such as in fog. If Audi pre sense front detects a pending collision, it warns the driver according to a graduated concept. 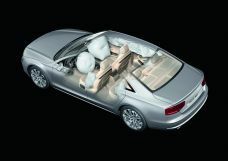 All of the versions of the new models include the safety system Audi pre sense city as standard equipment. At speeds of up to 85 km/h (52.8 mph), the system scans the road for other vehicles and pedestrians using a windshield-mounted front camera with a range of up to 100 meters (328.1 ft). If there is the threat of a collision, the driver receives a series of warnings, and if necessary the car starts to apply the brakes fully. At speeds up to 40 km/h (24.9 ft), it can fully prevent accidents within the system limits. At higher speeds up to 85 km/h (52.8 mph), warnings and brake intervention can reduce the impact velocity. At speeds up to 85 km/h (52.8 mph) Audi pre sense city observes the road with respect to other road users (e.g. vehicles and pedestrians). For this purpose, it uses the standard-equipped front camera on the windshield, which can capture events up to a distance of about 100 meters (328.1 ft). On threat of a collision, it warns the driver according to a graduated concept (warning, warning jolt and automatic emergency braking); if necessary, it initiates full deceleration. At speeds up to 40 km/h (24.9 mph) accidents can be avoided completely within the system limits. At higher speeds (up to 85 km/h (52.8 mph)), warnings and brake intervention can reduce the impact velocity. 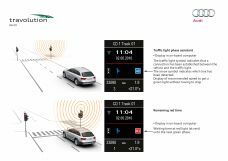 The turning assist is another Audi innovation that monitors oncoming traffic during left turns (on cars with left-hand drive). It has an operating range between 2 and 10 km/h (1.2 and 6.2 mph). In dangerous situations, it brings the car to a complete stop. The system becomes active in the background as soon as the driver turns on the left turn signal. The turn assist monitors oncoming traffic when turning left at low speeds. In a dangerous situation, it slows the Q7 to a halt. This intervention keeps the Audi Q7 within its own lane. The system is enabled at speeds of between two and ten km/h (1.2 - 6.2 mph) once the driver operates the turn signal to turn left. The exit warning is activated when the new Audi A4 and Avant stop moving. If other vehicles are approaching from behind, it warns occupants as they open the doors. The system warns drivers by means of LED fiber optics in the inside door-opening mechanism (contour lighting). In situations that are assessed as dangerous, special high-performance red LEDs blink and light up. The exit warning stays on for approximately three minutes after the ignition is turned off. The exit warning comes into play once the large SUV has stopped. Should vehicles or bicycles now approach from behind, the system warns the driver and all passengers when they start opening a door. The system uses the LED light guides of the light package in the doors – in a situation identified as hazardous, special high-power LEDs flicker and light up red. The exit warning remains in readiness for about three minutes after the ignition is switched off. An ideal supplement to the park assist is the cross traffic assist rear. When slowly reversing, such as when exiting a perpendicular parking spot or a narrow driveway, it warns the driver of approaching vehicles it considers to be critical. Notification is staged – visual, acoustic and finally with a jolt of the brakes. The system uses the data from the rear radar sensors. The rear cross-traffic assist is activated when the parking assist is turned on. When this occurs, drivers who are slowly driving backwards (for example, while leaving a parking spot at right angles to the road) are warned about approaching vehicles in critical range. There are different levels of warnings: visual, acoustic and a short jolt of the brakes. The back radar sensors provide the necessary data. The cross-traffic assist rear uses the rear radar sensors to warn the driver, if the parking system is enabled, while reversing slowly, as when pulling out of a perpendicular parking spot in front of other vehicles detected as critical threats. The warning occurs in graduated form – visually on the MMI monitor, acoustically and, if necessary, with a jolt. The park assist is the top-of-the-line solution and can steer the Audi Q2 into parking spaces. While driving at slow speeds, two ultrasonic sensors detect suitable parallel or perpendicular parking spots. The driver just has to engage the proper gear, use the accelerator and the brakes. The park assist backs the compact SUV into the spot. The Parking assistance system features the park assist (also available separately). With the help of twelve radar sensors, it helps maneuver the car into parking spaces that are parallel or at right angles to the road, which it identifies independently when driving at a moderate speed. Furthermore, it can make its own way out of parking spaces parallel to the road. All the driver has to do is accelerate, shift gears and brake. The park assist system, which practically automatically steers the new Q7 in parallel and perpendicular parking and pulls out of parallel parking spots by means of twelve ultrasonic sensors. The package also includes the 360 degree cameras. They display different views of the car’s immediate surroundings on the MMI monitor, including a virtual bird’s eye view and 180-degree images of the front and rear. Such views are very helpful with confusingly arranged exits, and in combination with the cross-traffic assist rear. The emergency assist activates if no reaction on the part of the driver is detected despite warnings from Audi active lane assist. After visual and acoustic warnings plus multiple brake jolts with flashing of the hazard warning lights, the final measure is for the system to autonomously bring the Q2 to a complete stop and activate the parking brake. The lane change assistant Audi side assist is active at speeds of 15 km/h (9.3 mph) and above. It uses two rear-mounted radar sensors with a scanning range of roughly 70 meters (229.7 ft). If a vehicle is located in the blind spot or approaches rapidly, a warning LED in the housing of the respective exterior mirror lights up. If the driver still operates the turn signal, the LED flashes brightly several times in succession. If the new A4 allroad quattro is used as a tow vehicle, the optional trailer maneuver assist steers the car-trailer combination backwards in the direction the driver indicates with the rotary/push-button control of the MMI. It also manages turning the steering wheel in the opposite direction and stabilizes the trailer when driving straight ahead. If the new Audi Q7 is serving as a towing vehicle, the driver can enable the trailer maneuver assist when reversing. The driver then need only shift to R and cautiously accelerate. He can then continuously vary the angle of reverse motion by means of the rotary/push-button control in the MMI. For traveling straight ahead, the driver taps once on the control. The picture from the rear view camera on the MMI monitor contains auxiliary lines as a guide. The trailer maneuver assist turns the steering wheel and directs the trailer onto the selected course in a stable fashion, so that the driver can steer the entire car/trailer combination by means of the rotary/push-button control of the MMI. 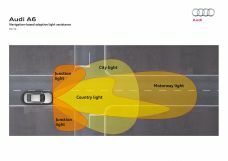 One of the latest assistance systems from Audi is Audi active lane assist. 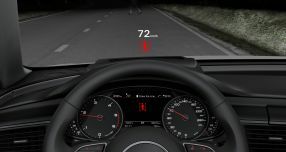 At speeds above 60 km/h (37.28 mph), it uses a camera mounted in front of the rearview mirror to detect the lane markings. It observes the road to a distance of more than 50 meters (164.04 ft) and a coverage angle of roughly 40 degrees. It delivers 25 high-definition images per second. The lane change assistant Audi side assist is available in an entire range of Audi models. It monitors the traffic behind the vehicle and warns the driver as necessary prior to critical lane changes. The EuroNCAP safety organization recognized the potential of Audi side assist for preventing accidents and awarded it a prize in fall 2010. The night vision assistant is an assistance system for the larger model series from Audi. The heart of this system is a thermal imaging camera at the front of the vehicle. It has an angle of view of 24 degrees, and its protective window is cleaned by a separate nozzle and heated when cold. As a far infrared system (FIR), the camera reacts to the heat radiated by objects in the recorded scene. A computer transforms the information from the camera into black-and-white images and displays them on the central display located between the instruments. Audi offers a variety of different parking systems for its complete model line-up. They use ultrasound, acoustic and optical signals, or a rearview camera whose images are displayed on the on-board monitor. The most convenient solution is the park assist. Like all assistance systems from Audi, the purpose of the speed limit display is to reduce the burden on the driver. It shows the driver the current maximum permissible speed in the instrument cluster or on the optional head-up display. 37 light-emitting diodes in each of the headlights of the new R8 Spyder produce a bright LED light that can be augmented with the optional Audi laser light. A module with four high-power laser diodes, each of which is just 300 micrometers in diameter, emit a blue laser beam with a wavelength of 450 nanometers. A phosphor converter converts it into white light with a color temperature of 5,500 Kelvin, which is pleasant to the human eye. For the first time in a series-production Audi, Matrix OLED technology (organic light emitting diode) is used in the rear lights as an option. These emit an extremely homogeneous, precise light. The light does not cast any harsh shadows and does not require any reflectors – this makes the OLEDs in 3D design efficient, lightweight and visually impressive. Each rear light contains four wafer-thin units that become smaller from the inside out. The biggest bears the TT logo and the four Audi rings. The laser spot doubles the range of the high-beam light. In each headlight there is a module with four powerful laser diodes that are just 300 micrometers in diameter. They generate a blue laser beam with a wavelength of 450 nanometers. A phosphorus converter converts it into white light with a color temperature of 5,500 Kelvin that is pleasing to the human eye. The laser spot – which is active outside of urban areas at speeds of 60 km/h (37.3 mph) and above – offers tremendous advantages in terms of visibility and safety to drivers. An intelligent camera-based sensor system detects other road users and actively adjusts the light pattern to dim the light intensity specifically for them. 419 kW (570 hp), from 0 to 100 km/h (62.1 mph) in 3.4 seconds: The Audi R8 LMX (12.9 liters of fuel per 100 kilometers [18.2 US mpg]; 299 grams CO2 per kilometer [481.2 g/mile]) offers breathtaking performance and groundbreaking technology. ** The limited-edition car is the first production car in the world to come equipped with laser high beams. In lighting technology, Audi is driving progress at high tempo. The innovative Matrix LED Headlights in the new Audi A8 (Combined fuel consumption in l/100 km: 11.3 – 5.9; Combined CO₂-emissions in g/km: 264 - 144)** make driving more composed than ever and set new benchmarks with respect to design and technology. 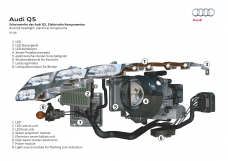 Audi is further extending its lead in automotive lighting technology. In the sponsored project “intelligent laser light for compact and high-resolution adaptive headlights” (iLaS), the brand with the four rings is working on the headlights of the future with partners from industry and science. Matrix Laser technology and its high resolution will make roadway illumination even more flexible and highly versatile – in all situations. The adaptive light is an Audi technology for the xenon plus headlights and is available in a number of different versions. In the top models its controller manages the swiveling modules so that they always deliver the perfect light for urban, interurban and highway driving. The driver can precisely control the function of the adaptive light via the Audi drive select driving dynamics system. The all-weather light integrated into the headlight replaces the fog light. Rear lights using LED technology are available either as standard or as an option in all Audi models. They produce a distinctive light pattern that in many cases also produces attractive three-dimensional effects. The LEDs are extremely long-lasting and practically maintenance-free. The most important thing, however, is how extremely quickly they reach their full luminosity: if the driver has to brake suddenly, the driver behind gains valuable fractions of a second. The LED headlights are an area of technology in which Audi is well ahead of the competition. They were introduced in 2008 on the R8 high-performance sports car; since then the brand with the four rings has repeatedly extended its lead. The daytime running lights of white light-emitting diodes are an Audi feature that underscores the distinctive design of the vehicles while simultaneously enhancing safety. They first appeared in 2004 in the Audi A8 W12. The luxury sedan had a light unit comprising five LEDs in each headlight. Xenon headlights are gas discharge lamps. Two tungsten electrodes are sealed in the burner, a thick-walled quartz glass cylinder filled with xenon gas. A concentrated electric arc burns between the electrodes, and the inert gas filling exerts a pressure of as much as 100 bar (1,450.38 psi). The xenon gas itself gives off a somewhat violet light. Metallic salts in the filling of the gas cylinder reduce its color temperature to 4,200 Kelvin. Audi vehicles are master communicators. Some of them can network with the Internet. The catchword here is Audi connect. This requires the Bluetooth car phone online, an extension of the top-of-the-line navigation system MMI navigation plus, that brings a UMTS module and a Wi-Fi hotspot to the car. The collaboration between Audi and Bang & Olufsen began back at the turn of the century. In 2005, the first Advanced Sound System was available as an option in the Audi A8. The openly propagated collaboration was a novelty in the European automobile industry and a great success. Today the Danish company’s high-end systems are available in numerous Audi models. Red lights not only annoy the driver, they also have a negative impact on the environment. In its efforts to improve efficiency, Audi is developing concepts for the intelligently managed traffic of tomorrow. As part of the travolution project, the engineers have developed a method by which the cars can communicate with traffic lights. This reduces fuel consumption and consequently emissions. The top-of-the-line system from Audi puts the brand in the pole position when it comes to multimedia. The MMI navigation plus is available for the large models, but is also available in a very similar form for the compact A1 (Combined fuel consumption in l/100 km: 7.1 – 3.8; Combined CO₂-emissions in g/km: 162 - 99)**. 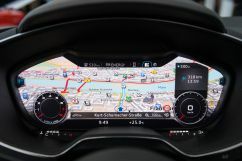 The top navigation system, the MMI navigation plus, is networked in a pioneering manner with the driver assistance and safety systems on board the large Audi models. Its navigation database describes the entire European road system in countless details. As the name suggests, Rear Seat Entertainment is a multimedia system for the rear seat. The latest version of this system is used in the A8. The backrests of the driver and front-passenger seats each integrate a high-resolution display measuring 10.2 inches diagonally. They can be tilted 10 degrees and are capable of displaying different content. A sensor enables their brightness to adjust automatically to the lighting conditions inside the vehicle. They are controlled via a separate MMI controller in the rear center armrest. When it comes to sound systems, Audi listens to the wishes of its customers. There are three systems from which to choose in the A8, for example. The Audi Sound System is standard, with Bose surround sound and the Bang & Olufsen Advanced Sound System available as options. Audi know-how is incorporated into all three solutions. “German engineering meets Silicon Valley” – a fitting slogan to describe the partnership that Audi has been nurturing with the Nvidia Corporation since 2005. This partnership quickly moved the brand with the four rings into a leading position in automotive infotainment. Nvidia technology enabled such innovations as the world’s first integration of Google Earth navigation and the elegant graphics featured in many models. 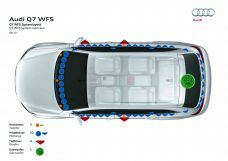 Passengers in many models are protected by the Audi adaptive restraint system, which in some model series is networked with the predictive safety system Audi pre sense. The system draws its information from an entire array of acceleration and pressure sensors. The Audi prologue piloted driving show car is a focus at CES. 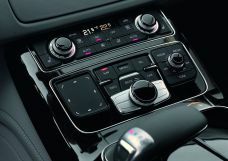 It not only stands for a new design era, but also integrates many innovations in the areas of connectivity, infotainment and user interface which Audi will be showing at 2015 CES. In this connection, this show car’s laser matrix headlights and perimeter sensorics will demonstrate how the car of the future will become ever more of an assistant to its occupants. After all, the Audi prologue piloted driving stands for the state of technology, which includes piloted driving. Audi pre sense is a technology package for predictive safety. It is available in a number of different expanded levels in most of the larger Audi model series.